On Saturday night, Oklahoma State’s super sophomore forward Marcus Smart, a potential NBA lottery pick, got into an altercation with a fan after being fouled hard into the crowd. The fan, Jeff Orr, made a remark to Smart that triggered Smart to shove Orr, leading to a technical foul. 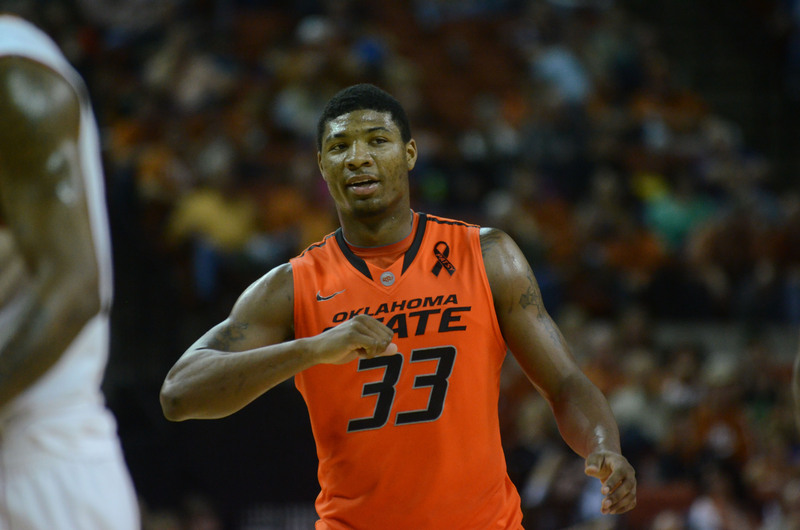 Oklahoma State Forward Marcus Smart. The Big 12 Conference will be reviewing the matter today & surely giving a ruling quickly. No matter what was said to Smart, this is a lesson for the young man that he has to be able to keep calm in tough situations. As he gets to the next level, he will have far more hecklers who pay a lot more money to tell Smart terrible things about his family, manhood, etc. And yes, it does hurt, and yes, fans should have even a slight bit of decorum, but as we all know, fans take the literal meaning of the team, meaning “fanatic,” to a whole new level seemingly on a daily basis. Where this could get a bit scary for Smart is if Oklahoma State or the Big 12 Conference comes down with a suspension similar to the Ron Artest suspension for the fight at the Palace of Auburn Hills years ago when the Pacers & Pistons had their crazy brawl in the crowd. Marcus Smart has been in the public eye for a bit, now, and if the reports are true that this fan said the “N” word to him, he has to understand that Orr is ignorant and be a stronger person, and feel that way to anyone else that would stoop that low to say those words to him. Though it is sad that in 2014 that racism still exists at that level, but I digress. Smart will learn from this, & honestly, this will – & should – blow over quickly, but what about the fan? Yes, I understand that fans have freedom of speech with what they say & all, but Jeff Orr should not be allowed to attend another Texas Tech basketball game IF it is true about what he said to a kid. Really? That makes him a big man. I think he is lucky that he wasn’t in the streets or anywhere like that saying stuff. However, it still goes back to Smart. He has had some other emotional outbursts this season because of the Cowboys decline over the last couple of weeks, most notably mentioning that most players are flopping because they aren’t getting the referee calls. This is a situation where everyone can come out of this far better than they went in, as long as Smart is just plain Smart.